Musculoskeletal Examination is a user-friendly textbook designed for students, physical therapists and physicians. It is uniquely multidisciplinary in its approach, being written by a physiatrist, physical therapist and orthopedist. With tables and boxed features to emphasize and summarize key concepts, and 'sample examination' boxes to highlight and test difficult areas, it is ideal for teaching introductory courses yet detailed enough for professional reference within clinical practice. It includes an easy-to-follow examination process for all the joints and spine, as well as combining biomechanics with physical examination to enhance understanding of function. This third edition includes more and better anatomy illustrations; over 850 illustrations, x-rays and MRIs are perfect as a quick reference guide, while the detailed descriptions and clinically relevant examples of frequently encountered conditions will help out even the most novice practitioner. 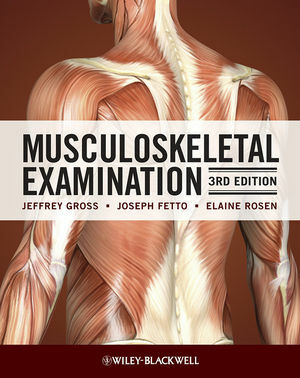 The chapter on basic science, the brief overview of anatomy, and the introductory remarks at the start of each chapter that provide a biomechanical overview of the region featured, all ensure Musculoskeletal Examination will help you gain the understanding necessary to make a correct diagnosis and determine a successful treatment plan for your patients. Musculoskeletal Examination is ideal for physiotherapists, physiatrists, orthopedists, medical students, practitioners and all those involved in sports medicine and clinical massage. Jeffrey Gross is Clinical Associate Professor of rehabilitation medicine at NYU school of medicine, and Medical Director of the Union Square Rehabilitation and Sports Medicine. Joseph Fetto is Clinical Associate Professor in the Department of Orthopaedic Surgery at NYU School of Medicine and at the Manhattan V.A. Medical Center. Elaine Rosen is Associate Professor in the Department of Physical Therapy at Hunter College, City University of New York.